This is the more easterly of two natural arches which stand close to each other at the foot of Rough Brow. 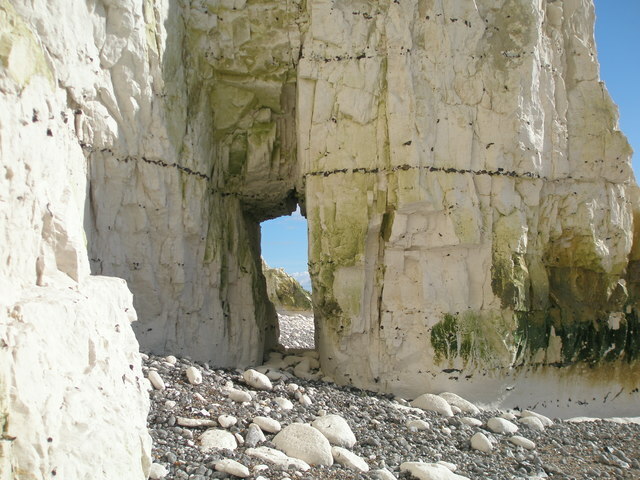 Like the other natural arch, it has been caused by the erosion of a chalk buttress at the foot of the cliff. © Copyright Adrian Diack and licensed for reuse under this Creative Commons Licence. Although the coast is short in length in this grid square, it contains many interesting features. Within a small distance of each other, there are, for example, two natural arches. Between these arches and at a point closer to the more eastern of the two arches, there are eroded stumps which indicate that a double natural arch may have been formed there at a former time. Just to the west of the more westerly positioned arch, a cave has been cut by the erosive power of the sea. Individuals who stand on the cliff edge above features like caves are not always aware that the ground beneath their feet has been undermined. Surface water drains through the porous chalk and this can lubricate structures such as faults. Given that 10 metres or more of cliff edge could break away without warning, this is clearly not a safe place to stand. However, the exact degree of danger which is posed by either standing or walking on the top edge of the cliff or, indeed, at the base of the cliff is open to debate.